Remastered editions of Queen’s last five studio albums – The Works, A Kind Of Magic, The Miracle, Innuendo and Made In Heaven – will be re-issued on 5 September 2011 to coincide with what would have been Freddie Mercury’s 65th birthday. Recorded between 1984 and 1995, the albums include classic tracks such as ‘Radio Gaga’, ‘I Want To Break Free’, ‘One Vision’, ‘A Kind of Magic’, ‘I Want It All’, ‘The Miracle’ and ‘These Are The Days of Our Lives’. Also released on the same day is Queen: Deep Cuts 3. Debbie Harry and her band Blondie have revealed that they plan to release a new album next year. Titled Panic of Girls, it will be Blondie’s ninth studio album and their first collection of new material since The Curse of Blondie in 2003. According to Blondie drummer Clem Burke, the band has already recorded about 35 new songs in Woodstock, New York – with 14 of the songs expected to make it onto the album. He hints that some of the surplus songs may be released via the Internet. It’s the first time the band has recorded outside Manhattan since Automamerican, which was produced in Los Angeles in 1980. He says everyone in the band contributed songs, although Debbie Harry – who turned 65 in July – wrote most of the lyrics. The album title, Panic of Girls, is a line from one of her new songs. Burke says Blondie has been previewing a handful of the new songs during its summer tour dates – including the tracks ‘What I Heard’, ‘The End’ and ‘Mother’. 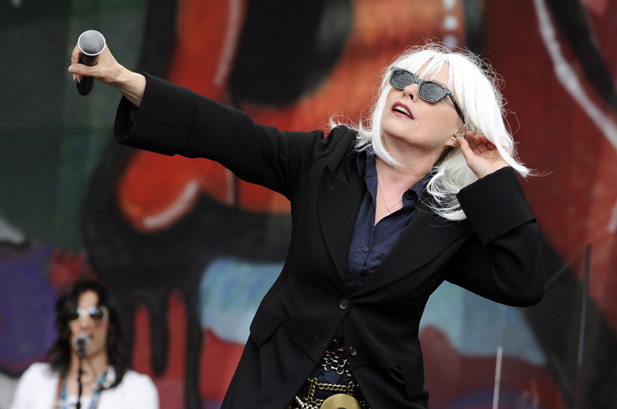 Debbie Harry admits she’s pleased to have some new songs to perform on stage. “I feel a definite urge to not just do old songs,” she says. “I really want to have a voice in the present, so I’m very happy that this is all going on because we’ve been stuck in a position for a couple of years where we weren’t recording. We’ll soon be launching Sh-Boom! as a digital magazine. You can read a sample edition of the magazine here (best viewed in fullscreen mode). If you’d like to receive a FREE personal copy of each issue, simply complete the registration form. Sir Cliff Richard is to celebrate his 70th birthday with a series of six spectacular concerts at London’s Royal Albert Hall between Monday, 11 October and Sunday, 17 October 2010. The only night Sir Cliff won’t be performing during that week is Thursday, 14 October – his 70th birthday. Accompanied by a Swing Band, Cliff will sing many of the hits from his 52 year career, along with a selection of songs from his forthcoming album, Bold as Brass. The special 70th birthday shows follow Sir Cliff’s solo 50th Anniversary concerts in 2008, and his 36-date reunion tour with The Shadows in 2009 and 2010. Sir Cliff – who had his first hit in 1958 with ‘Move It’ – has sold more than 250 million records to date. He is the only UK artist who has had a Number One hit in each of five decades from the 1950s to the 1990s. Sir Cliff is also said to be launching his own brand of sparkling wine to mark his landmark birthday. He owns a vineyard in Portugal’s Algarve region, where he already produces his own brand of wine called Vida Nova. Despite reaching the big ‘70’, and planning to perform on a gruelling six nights out of seven, Cliff insists he is as fit as ever … an inspiration to any Sh-Boom! readers who have also had to blow out 70 candles this year. Bob Dylan fans are set for a treat this autumn with the release of Tell Tale Signs – a multi-disc compilation album consisting of alternative takes, previously unreleased studio recordings, demos, live tracks and rarities from 1989 to 2006. Tell Tale Signs is the long-rumoured eighth volume in Dylan’s Bootleg Series. It will feature unreleased recordings from his studio albums from the last two decades – including 1989’s Oh Mercy, World Gone Wrong (1993), Time Out of Mind (1997) and Modern Times (2006). Also included are tracks which were specially recorded for film soundtracks such as Lucky You (‘Huck’s Tune’) and Gods & Generals (‘Cross the Green Mountain’). There’s also a track from an album that Dylan started recording with David Bromberg in 1992, but which was never finished or released. Another rare gem is Dylan’s duet with Ralph Stanley on the song ‘The Lonesome River’. Tell Tale Signs: Rare And Unreleased 1989-2006 will be available in both a 2CD and 3CD format. The 2CD, 27-song edition will feature a booklet of rare photographs, liner notes and recording credits. The 3CD set is understood to be a deluxe limited edition that will include a 12-track bonus disc and a hardcover book of photographs of all of the singles Dylan has released throughout his career. Tell Tale Signs is also expected to be released as a limited edition four-LP set which will be pressed on 180 gram vinyl and will include all of the elements of the 2CD set. Fans who visit Dylan’s web site (www.bobdylan.com) will be able to obtain a free download of ‘Dreamin’ of You’, a Daniel Lanois-produced track which is featured on Tell Tale Signs. The previously unreleased song was recorded during Dylan’s sessions for his album Time Out of Mind. ’High Water (For Charley Patton)’ (Live, Niagara, 2003). ’Cross The Green Mountain’ (From Gods and Generals soundtrack). ’Mary And The Soldier’ (unreleased, World Gone Wrong). You are currently browsing the archives for the Nineties category.